You did it. You decided to be brave and load the kids up in the car to head to your parents’ (a.k.a. Grandma and Grandpa) house for Christmas. While you are sure it will create some wonderful memories for your kids and their grandparents, you are a little stressed about how you are going to get all the gifts from your house to their house in one piece. 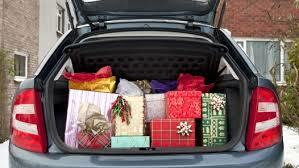 Have no fear; here are some ideas to help you fit every last present into your car. And yes, you will still have room for your suitcases. Surely you have played Tetris before. You know, that game where you have to turn and flip all the little blocks to fit perfectly on the screen so you can get lots of points and not get a game over? Why not pretend like the gifts are your Tetris blocks and your trunk is the screen? Try to pack them in so there is absolutely no wasted space. That includes under the seats, the console, and the door compartments. If you wrap all of the gifts in advance, you may find it a little harder to play the perfect Tetris game for fear of ripping the paper. Instead, just bring the wrapping paper with you (or better yet, buy it there) and wrap the gift upon your arrival. That way, you won’t have to worry about the fancy wrapping while arranging the items to perfection. If you are concerned about the kids seeing the gifts, black garbage bags are great gift concealers while still being pliable. If the thought of packing your car full of presents still stresses you out, you have other options. The holiday season is all about cheer, so anything that goes against that should be avoided. One option is to purchase the gifts online and have them shipped directly to your parents’ home. This may even save you some money on the gifts if you work it right (online is notorious for great deals). Of course, the final choice is to consider cash or gift cards. While they are not nearly as fun to give, at least your kids will get exactly what they want.